Here are some screen shots of Plato's class library window. 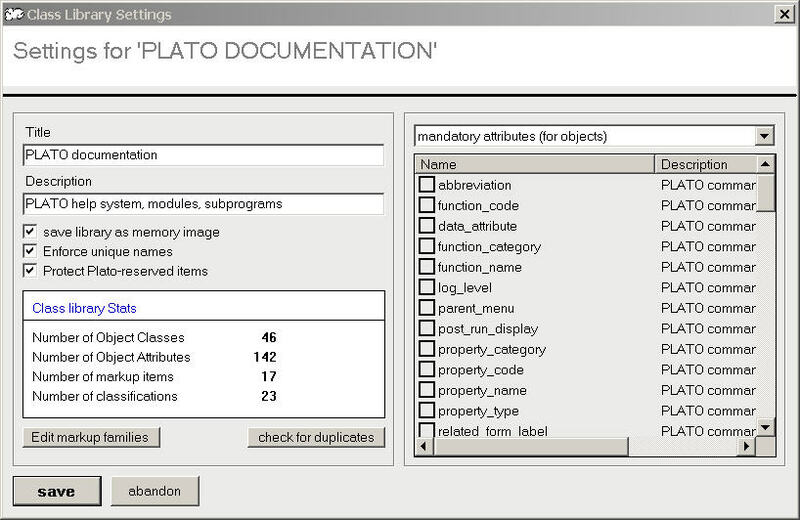 shows the class library window with object classes displayed. 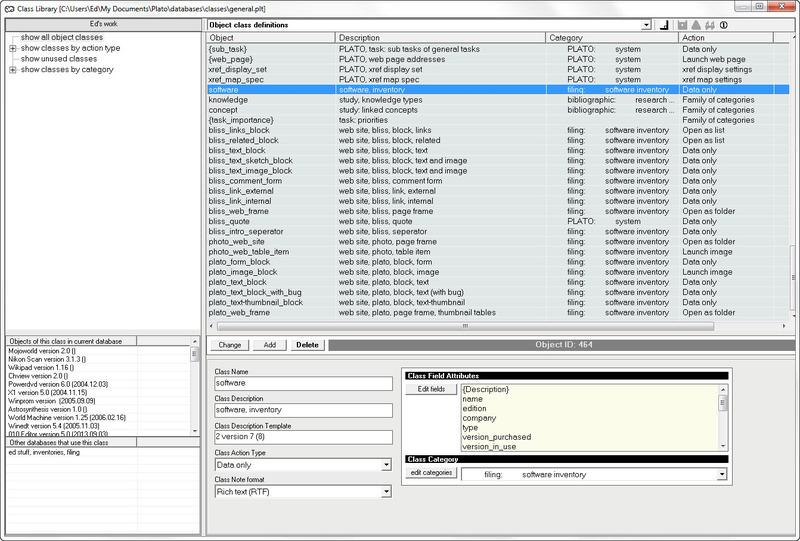 Object classes in the library are displayed in the top right pane; below then is the editing pane for editing the selected object class. 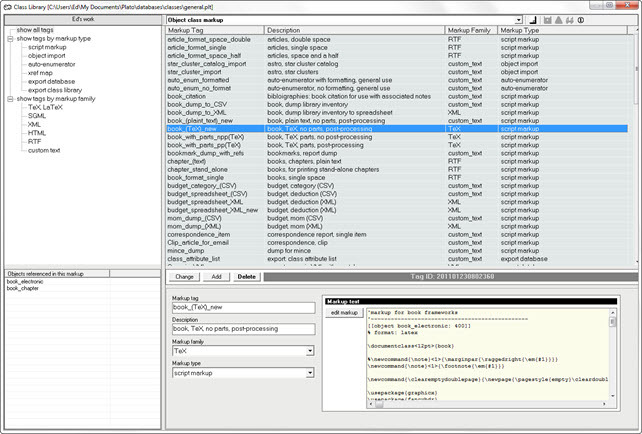 In the left pane is a class object filter (top) where smaller subsets of the object class list may be displayed by clicking on a filter category. 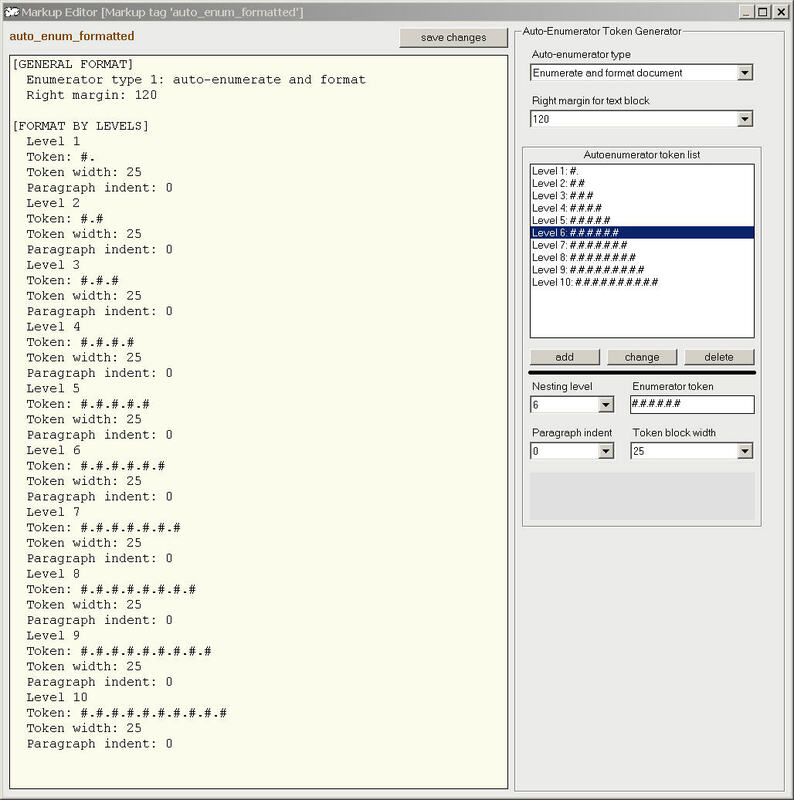 Below the filter are two panes showing where the selected object class is currently used: the top panes show instances of the object class in the current database; the bottom pane shows which databases use the selected object class. 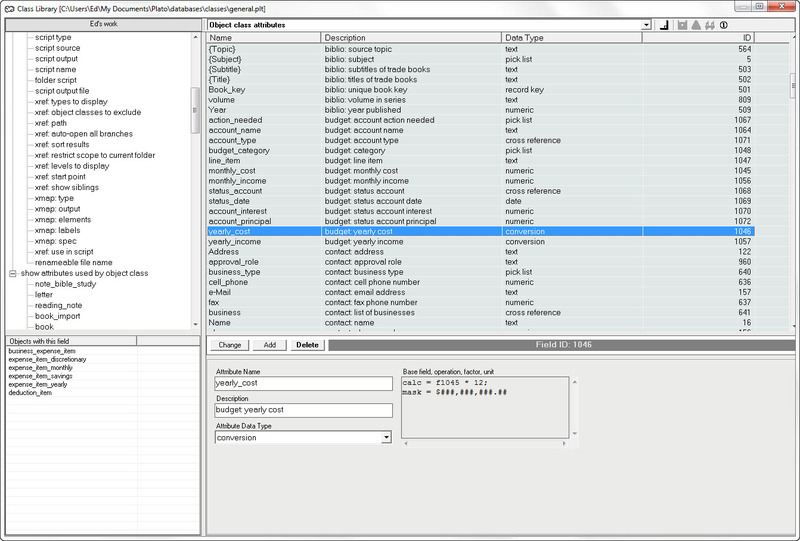 shows the class library window with class attributes displayed. Class attributes are displayed in the top right pane; below them is the editing pane for editing the attribute's properties. 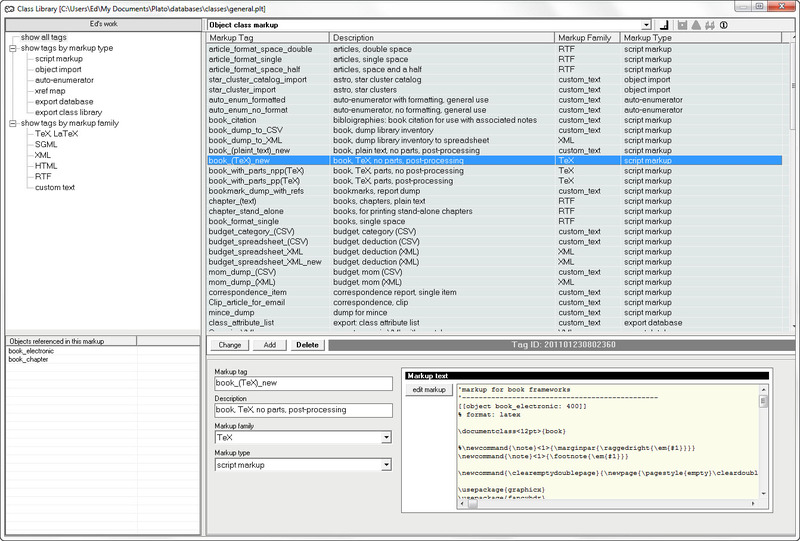 In the left pane is an attribute filter (top) where smaller subsets of attributes may be displayed by clicking on a filter category. Below the filter is a pane showing which object classes use the selected attribute. 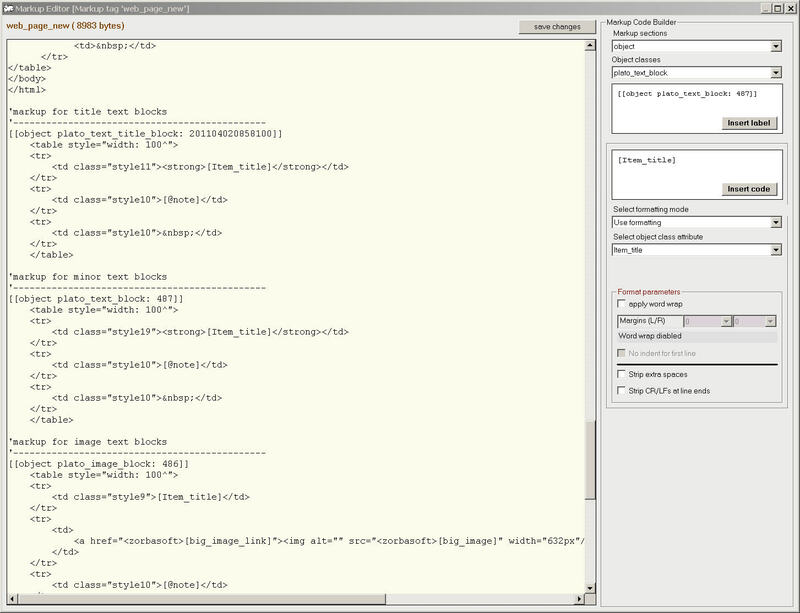 shows the class library window with markup displayed. 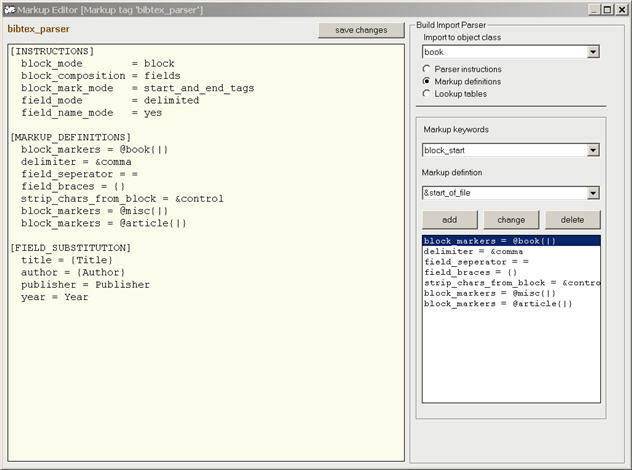 Markup are displayed in the top right pane; below them is the pane for editing markup attributes (The markup itself is edited in a seperate window, accessed by pressing the "edit markup" button). In the left pane is a markup filter (top) where smaller subsets of the markup may be displayed by clicking on a filter category. 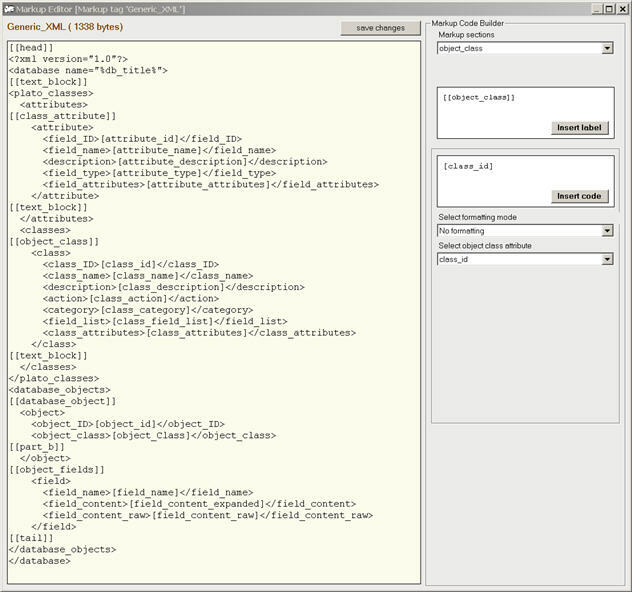 Below the filter is a pane showing which object classes use the selected markup. shows markup displayed in the editing pane. This pane has features for marking up tags (tags for Plato are snips of markup code)--in this case, the preface to an HTML file. This is a paired tag; TAG A contains the start of a file, TAG B contains the end of it. The in-between pieces are handled by other tags. shows markup displayed in the editing pane. This screen shot shows markup for an importer, which is used to import data from files, databases, of the like into Plato. Importer markup is generated by forms with menus, which are shown at the right of the markup pane. shows markup displayed in the editing pane. This markup is a 'swap list', which is used to substitute certain characters or add markup to specific words. shows markup displayed in the editing window. This markup defines 'auto-enumerators,' which generate ad-hoc paragraph or section numbering schemes and add them as mark up to documents. This is useful for markup languages that lack auto-enumeration features, or when you need something more flexible or elaborate than a markup language allows. shows the class library settings window. Class library settings define mandatory attributes for object classes, which object classes and attributes should be protected from deletion or editing, and other things.